With global players exploring India as a talent pool for animation content and Indian filmmakers looking out for subjects with a “broad mass appeal”, there’s a huge potential for the growth of the animation education in the country. 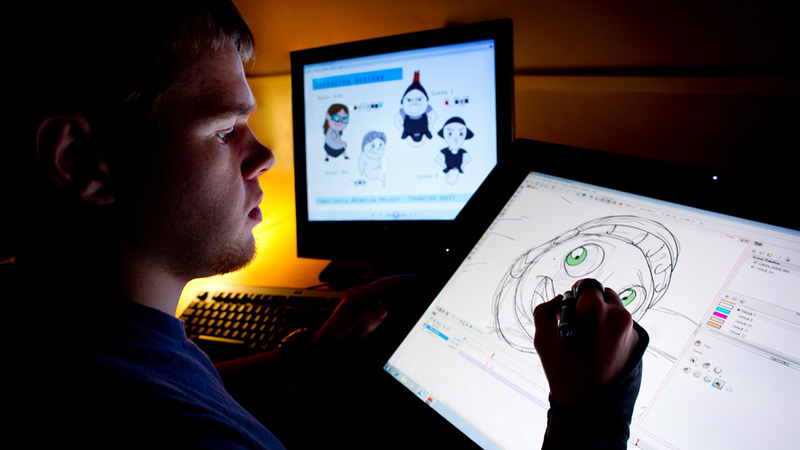 India’s animation industry is large and growing rapidly. Animation, gaming and web design professionals work on full-length animation movies, create TV commercials, education CDs, work in the advertising industry or as web designers in various companies. Animation and VFX are used widely in many areas like TV, films, ads, medicine, training & education, e-learning, legal & insurance, 3D visualisation, architecture, etc. Another interesting area in this industry is the creation and design of games for PC, Internet, mobile, gaming consoles (Playstation/ Xbox). The gaming industry is estimated to grow at 14.3 per cent per year to touch INR 45.8 billion by 2019. As this industry is growing so fast, there is a constant demand for skilled professionals from both, Indian studios as well as for internationally outsourced projects. The creation of moving pictures in a 3-dimensional digital environment. It is done by sequencing consecutive images or 'frames' in a gradual progression of steps, filmed by a virtual 'camera' & then output to video by a rendering engine. The creation of moving pictures in a 2-dimensional environment through traditional animation or in computerised animation software. Designing websites, creating rich media content for the web, viral ads and internet games. Blending live action footage with computer generated characters, objects and effects to create realistic computer generated digital video & film sequence. Designing games for PC, Internet, Touchpads, Mobile & Consoles (such as Playstation or Xbox). Creating design and audio-visual content using different media & formats such as text, pictures, music, sound, videos, films, animations, and more. E-learning refers to the use of learning & teaching via electronic technology -computer software, internet, audio/video devices, TV, etc. Creators of E-learning modules use rich media, audio, video & graphics to teach a particular topic. Arena Animation is the Animation, Web designing, VFX & Multimedia education arm of Aptech Ltd. Over the past 18 years, Arena Animation has successfully trained more than 400,000 students through its career-oriented courses. It offers number of courses on web design, VFX, animation, broadcast, multimedia and other short term courses. Maya Academy of Advanced Cinematic (MAAC) MAAC is the high-end 3D Animation & VFX education brand of Aptech. Through its wide network of centres, MAAC has prepared thousands of students for careers in Animation, VFX, Film-making, Gaming, Web and Graphics Design. The Academy provides quality education through career-oriented courses, leading to top-notch job placements. Zee Institute of Creative Art (ZICA) is the nation's first full-fledged Classical and Digital Animation Training Academy. It trains youth in classical 2D and modern 3D animation. It offers various courses for its PDP Program, Professional Programs and other certifications. Whistling Woods International Institute (WWI) for Film, Fashion & Communication was founded by Film-maker Subhash Ghai in 2006. Within a short span of 8 years the Institute has become the preferred destination to nurture creative talent in India & globally. It offers 3 years B.A. / B.Sc in animation. Not just these, but the likes of IITs also have courses on animation. To begin with, a few animated stunts were attempted in ‘Raja Harishchandra’ (1913) which was a silent movie. Many magic tricks later, the first film by the Indian Animation Industry was produced in 1957. ‘The Banyan Deer’ (1957) was made by a group of Indian animators under the guidance of Disney Animator Clair Weeks, who had worked on ‘Bambi’ (1942) and wanted to establish and train India’s first animation studio as part of the American Technical Co-operation mission. From the very first animated movie, The Banyan Deer, to creating one of India's biggest animation blockbuster, The Roadside Romeo, the animation industry in India has not only undergone an evolution but also witnessed unprecedented growth in the recent years. Many big studios and companies like Walt Disney, Sony Pictures & Turner Entertainment, which make animated films, TV ads & computer games, are off-shoring animation content to India. Many Indian animation studios & production houses are packed with work be it outsourced from abroad or in-house projects for the market in India. Hence, the Indian animation industry is certainly facing a talent crunch. In India, effective production pipeline, skilled workforce and infrastructure have been some of the major hurdles in the animation industry. The leading companies of today have all this in place roughly, which means there remains huge scope for improvement and the future of the animation industry is yet to grow by leaps and bounds. India’s animation education has seen unprecedented growth. The current animation business in India revolves around production, post production and VFX. This is soon to change with the incorporation of preproduction into the production profile. With the increasing confidence of the international community, India is soon to be trusted with the generation of original content, which calls for many new institutes offering courses on animation education. Thus, Indian animation education presents a vast opportunity to be tapped by potential edupreneurs. With global players exploring India as a talent pool for animation content and Indian filmmakers looking out for subjects with a “broad mass appeal”, there’s a huge potential for the growth of the animation education in the country. Books To Inspire Young Franchisees..
Trendiest Education Business Ideas in Nepal.. Challenges For Inculcating This Edu Trend..
Make A Career In Counselling Business..
Why edupreneurs are eyeing online tutoring..
Is Cocktail-Beer Changing The Brewery Biz..
Why Online Tutorial Gained Momentum.. Experts on Restaurant Business Survival Tips.. Some Mistakes That EdTech Startups Commit..